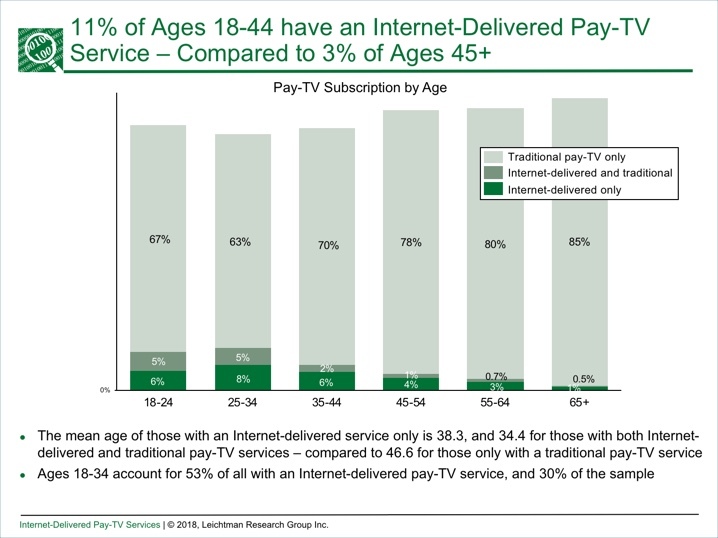 12% of 18-34 year-olds in the U.S. are now subscribing to a skinny bundle such as Sling TV, DirecTV Now, YouTube TV, Hulu with Live TV or PlayStation Vue, according to new research from Leichtman Research Group. This group accounts for 53% of adults who subscribe to a skinny bundle. Just 3% of people 45+ take a skinny bundle. The data is part of LRG’s first survey on the topic, so there aren’t any trend lines available. Skinny bundles have been around for several years, and multiple analysts have estimated there are somewhere between 4-5 million U.S. homes now subscribing. It’s still very early days for skinny bundles as there’s been very little mass marketing to date. No surprise, LRG also found that 93% of skinny bundle subscribers also subscribe to an SVOD service like Netflix, Amazon and/or Hulu, supporting the idea that these users are “cobbling together” their favorite video services. 49% of them have a TV antenna and 35% still take a traditional pay-TV multichannel service, which suggests they may still be testing out the skinny bundle to see whether it qualifies as a potential replacement. Satisfaction seems to be running high with 69% of skinny bundle subscribers saying they’re very satisfied, although 27% say they are very likely to switch from their skinny bundle in the next 6 months. And although a key selling point of skinny bundles is mobile viewing, LRG found that subscribers watch at home 78% of the time. This compares with Netflix at 88% and HBO Now at 80%. Because skinny bundles include fewer TV networks than traditional pay-TV services, this creates a liability (what I’ve called the “Swiss cheese” issue because of the holes in the lineup). 76% of respondents said that there are specific networks or programming genres that are “must haves” which likely means any decision to adopt a skinny bundle will be carefully scrutinized to verify desired networks are included.